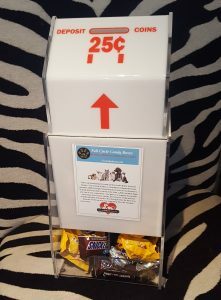 Full Circle Candyboxes has partnered with Butte Humane Society to support orphaned and abandoned pets and help find loving homes for each one. You can find Full Circle Candyboxes all around town with more than 100 candy boxes placed in local businesses in Chico, including at our Adoption Centers and Administration Office. Purchase of candy does not constitute a charitable donation. However, a portion of each candy purchase goes to benefit Butte Humane Society. If you would like to have a candy box placed at your business location, please contact Full Circle Candyboxes at decritc@gmail.com.